Vee's fourth-Wednesday-of-the-month Card Party has little to do with shuffling decks. Rather it's a Note Card Party, where attendees choose four photos previously published on their blogs to create a set of virtual note cards. As summer winds down, I thought a bit of pink would remind me of those heady days of the first blooms, of fresh flowers everywhere, of pink delights in gardens and homes. The first rosebuds are long anticipated and we watch closely as each petal unfurls to reveal the beauty within. I read here that sweet things taste better when served out of pink pastry boxes. Apparently pink makes us crave sugar. On this last Wednesday of August, enjoy the color pink, and nibble a little sweet alongside! And don't forget to visit Vee's Note Card Party for more sweet treats. Nice cards. I like the last one the best--just beautiful! The carnation atop the sheet music is extra special. Now it may feel as if it is the fourth Wednesday, though it really is only the third. =D That's right. We do these here parties on the third Wednesday of the month. Next one is September 19. I am very impressed and pleased that you were able to join us knowing that you are traveling and all. What a nice quote by Audrey...I think happy girls are prettier, too. What a great set of cards, Lorrie. My favourite is the peony. Beautiful cards especially the last one. Oh, goodness, Lorrie! Pretty in Pink is right! Gorgeous blooms!!! Wonderful selections for Vee's party. 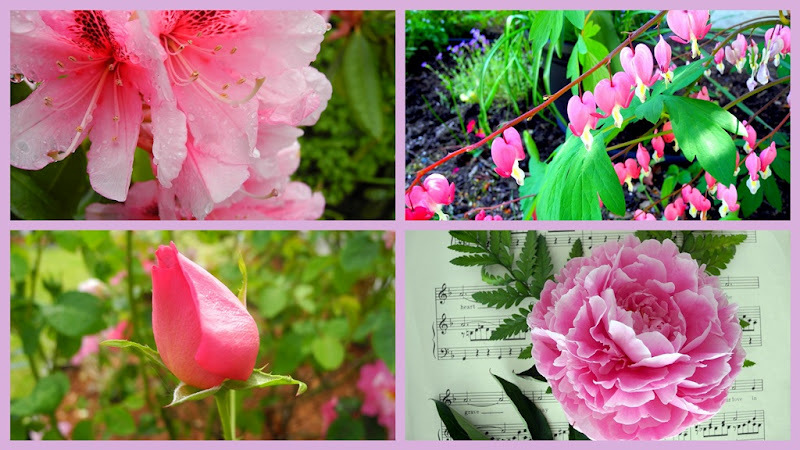 This beautiful pink photos would make lovely cards for a shower, birthday, so many different occasions. "Pink" is a charming theme. I love this Audrey Hepburn quote! Such truth. I also love your note card selection, Lorrie--the last photo of the peony with music sheet behind it is absolutely gorgeous. Enjoy your vacation! Beautiful! The perfect note card picks. These are gorgeous! And I didn't know that pink makes us crave sugar.... but it does explain all those pink boxes!!! These are wonderful choices Lorrie and I love the idea of combining Audrey's quote with such classy notecards - a perfect match!